The owner of 20 acres of land at the entrance to the city is in the process of hiring the firm that drafted Lynn’s Waterfront Master Plan, as local business leaders consider the next steps to promote development of the newly opened private waterfront property along the Lynnway. Varoujan Hagopian, a senior project principal and designer with Sasaki Associates, the planning and urban design firm with offices in Boston and San Francisco, said Monday his company is in discussion with Boston businessman Joe O’Donnell about O’Donnell’s Lynnway property. Hagopian said “there is intent” for O’Donnell, owner of Boston Concessions and part owner of Suffolk Downs, to hire Sasaki, noting his firm is in the “due diligence” process of contract talks. Businessman Joe O’Donnell’s property includes 20 acres at the southern most point of the land covered in Lynn’s Waterfront Master Plan created by Sasaki Associates in 2008. O’Donnell is in talks to hire Sasaki to come up with specific development plans for his property, while local business leaders form a regional economic development committee to, among other things, give input on potential developments for the waterfront. Hagopian said the local, state and federal regulatory issues involve, among other things, wetlands created by fill from the Big Dig, and well as a number of easements on the property. “Part of out expertise is to look at these issues; assess all the areas, figure out what the current value is, what the net-residual value is, how much can be developed within zoning regulations, and at that point make a market assessment that would look at market demand, cost of construction and whether it would be feasible (to build), and if not then to look at other scenarios,” he said. James Cowdell, director of the Lynn Economic Development and Industrial Corporation, said last Thursday he’s encouraged O’Donnell is working with Sasaki Associates, since ultimately it is up to the private landowners to decide what becomes of property targeted by the Waterfront Master Plan, particularly the 100 acres opened up by the recent relocation of the South Harbor power corridor. Efforts to contact O’Donnell were not successful Friday or Monday. Local business leaders, meanwhile, are closely following plans for the Lynn waterfront and hope to have a say in that planning. The Lynn Area Chamber of Commerce (LACC) is forming an Economic Development Committee that will have a strong focus on the Lynn waterfront, according to LACC Board Chairman and Columbia Insurance Agency Owner John Olson. The committee, he said in a meeting with the Item last month, will be comprised of Chamber members. Chamber member Patricia Keefe last November arranged for another international urban planning and design firm, The Jerde Partnership which has deigned many projects on the West Coast, as well as in Las Vegas and internationally in locations including Mexico City, Mexico, Osaka, Japan and Rotterdam, The Netherlands to meet with city leaders including Mayor Judith Flanagan Kennedy. There has been no follow-up on those meetings. 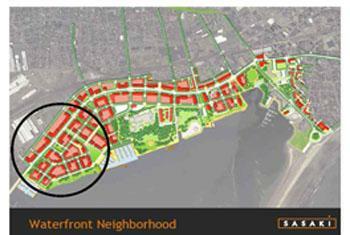 Keefe maintains the existing Waterfront Master Plan deals primarily with zoning. She said The Jerde Partnership would create a specific vision for the waterfront to make it a destination. The Waterfront Master Plan drafted by Sasaki and approved by the Council in 2008 covers approximately 300 acres from the Sagamore Hill Neighborhood down the length of the Lynnway to the General Edwards Bridge. It divides that whole area into four zones the South Waterfront Neighborhood (which includes O’Donnell’s land), the Marine Park Industry Center, Downtown Waterfront and Sagamore Hill Waterfront. The plan cites potential development uses that include multi-family residential buildings with first floors dedicated to retail space, research and development firms, a hotel, conference center, yacht club, marina, civic buildings, transit facility, public park and open space. Hagopian on Monday said Lynn’s Waterfront Master Plan was intended as “a framework only,” to be implemented through local zoning. “Obviously the land was very large, 300 acres, and the city lacked the resources for a detailed Master Plan,” he said, noting a detailed plan would take approximately two years to perform, rather than the nine-month framework plan the company completed. The Lynn waterfront, he added, is made up of many small and large privately owned parcels and to do a detailed plan would involve interviewing each one of them and coming up with a workable scheme for each of those parcels. “The framework is general guidelines” and not specifics for each parcel, he said. If Sasaki does enter into partnership with O’Donnell, he said the focus would be on a specific use for that site. “You’ve got to start somewhere. The first developer is always taking the biggest risk. But if you have a good development on one end, other people take notice and want to be part of the success story,” Hagopian said.